When a kid is asked about what his dream bedroom must look like, he or she would probably pick the theme of the most favorite movie or cartoon. Which is not surprising, because we all had some fantastic characters that influenced our personalities, hobbies and even professions. Today’s kid’s bedroom belongs to a young boy, who is absolutely keen on becoming a paleontologist and finding remains of oranopithecus. Meanwhile he was perusing books about dinosaurs and dreamed about having their images in his bedroom. The decorator, who was invited to implement his ideas, was determined to epitomize this wonderful hobby of a nine-year-old boy in the interior design. But what she wanted to avoid was template approach to dinosaur topic. Besides, professionals always think ahead, and she wanted the room to be similarly interesting for its master a few years later. For a start, two walls were painted smooth gray color. There is no need to use too saturated or bright hues in the work zone of the kid. And light gray is also especially welcomed beside the window, as it reflects natural light. The rest of the walls were decorated with a jungle wall mural that creates a nice contrast to light parquet boards on the floor. A loft bed design significantly increased the useful area of the room and provided the master with a full-fledged play zone underneath. Besides, it gave room for an extra storage area (a big drawer unit) and a turtle tank. The furnishing is bespoke. It is characterized by functionality, plain geometry, and contemporary feel enhanced by its black color. In general, this hue is not welcomed in toddler rooms, since it negatively affects kid’s mood and even mental health. But in small portions of décor it’s not forbidden. The general style concept is supplemented with a pendant lamp, shaped like an egg with a hatching saurian, and several egg-shaped ottomans. A part of the wall near the staircase is coated with black magnetic paint. It serves as a chalkboard and a notice board at the same time. 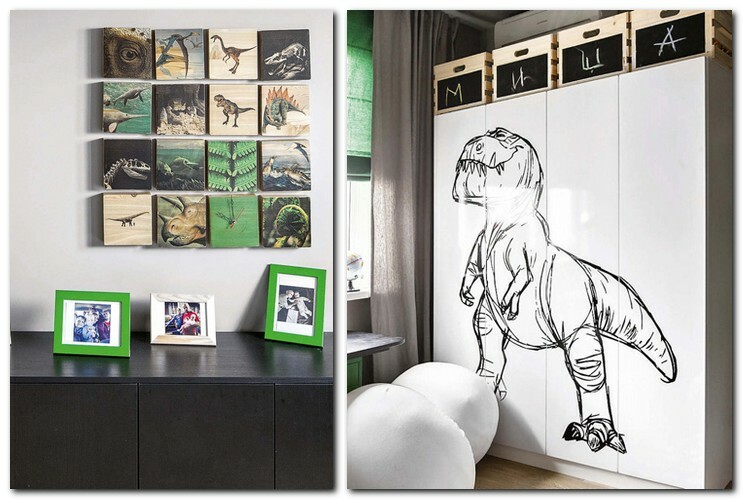 Especially for this project custom-made was a 12-piece canvas art from natural wood featuring dinosaur images. Also the room features a spacious wardrobe with push-to-open mechanisms. 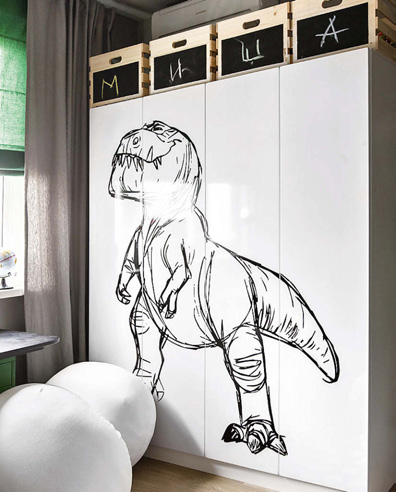 Thanks to a large-scale dinosaur sticker , it also refers to the Jurassic Park theme.